Sony to unveil superslim Vaio netbook at CES? 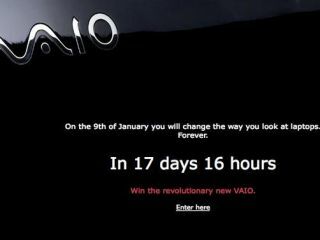 Is there going to be a Sony Vaio netbook unveiled at CES? Is Sony going to blow us all away with a superslim Vaio-branded netbook at CES next month? Remember those FCC-pics of rumoured Sony VAIO netbook from earlier this month? Sony has just launched one of those CES 'teaser' countdown websites announcing that: "On the 9th of January you will change the way you look at laptops. Forever". The only way we can imagine that we will change the way we look at laptops forever is if Sony managed to produce an Apple/Linux/Windows OS compatible machine that does everything that your desktop can do, but faster and with better graphics, audio and keyboard/mouse input. Oh, and it was slimmer than the MacBook Air and cheaper than the cheapest Asus Eee, to boot… And it had Blu-ray. Failing all that, we would be interested to have a look at Sony's inevitable Vaio laptop when it arrives – most likely at CES in Las Vegas on 9 January. For those FCC pics of the rumoured Vaio netbook, check out TechRadar's news from 5 December.